Afi Oubaibra was born in Antwerp, she got a degree in industrial sciences but goes full force into a musical career instead of choosing an office job! Her talent for singing is noticed in ‘Star Academy’, a star hunt for starting artists which she ends as runner-up. 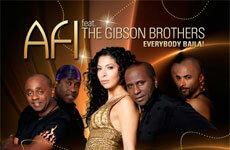 In 2006 Afi joins Eurosong, a contest during which the Belgian artist for the Eurovision Song Contest is selected. She did not reach the finals, but is happy to see that ‘Not That Beautiful’ becomes a hit song that ends up in the charts. May 2008 is the start of a new era, Afi changed her musical path in favour of music that much better fits her personality and style. The result of this is ‘Single Day’, a rock-pop song that has a deep and personal meaning for Afi. For this summer Afi found soul mates in the collaboration with The Gibson Brothers: passionate about music, dancing and singing. The single ‘Everybody Baila’ proves that summer will be hot and swinging, no matter what the weather will be. ‘Everybody Baila’ Afi feat. The Gibson Brothers is now available in the iTunes-store.